I post on thi s site, from time to time, some of my experiments with short fiction. I recognize that they aren’t very good, certainly not good enough for publication (I have written a couple of pieces I haven’t posted to this site yet that I hope are worthy of publication and submitted them to various literary journals, so far, to no avail). I do find some value in them, however, as exercises in trying to learn the craft of short fiction writing. I am vain enough to aspire to writing something memorable, and humble enough to know that I still have much to learn. As a neophyte, and as a devoted fan of the art form, I am sensitive to when I am making use of tired clichés and a lack of originality. 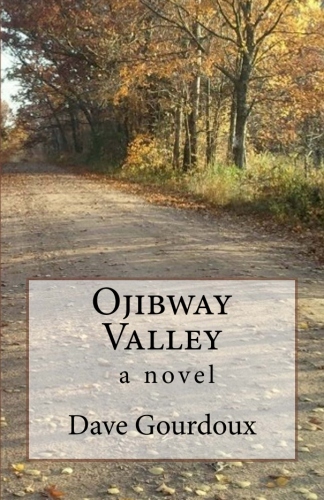 Two of the short stories I’ve posted on this site (“Highway Q”, of which I’m quite embarrassed, and “Night Watchman”, which is if nothing else better than “Highway Q”) rely upon that tired old plot device of the main character not knowing he is dead. When I wrote these stories, I thought I was ripping off things like Ambrose Bierce’s great short story “An Occurrence at Owl Creek Bridge” (which, in “Highway Q”, I was) and movies like “The Sixth Sense” or “The Others.” In all honesty, this wasn’t my intent when writing either story, and I remained somewhat mystified at why this was an attractive plot device to me. Last night, something triggered a memory for me, and I think now I know where my fascination with this cliché came from. I was 12 or 13 years old, and it was the last day of school, the best day of the year. School being out meant summer and baseball and sleeping in and, best of all, it meant staying up late at night. That year, on the first night of summer vacation, a Friday night, I vowed to stay awake for Nightmare Theatre, with Dr. Cadavarino, on channel six, sometime after midnight. I didn’t quite make it, falling asleep on the couch, but I woke up in time to see black and white footage of a strange woman wandering through a deserted carnival. I had missed the beginning and the name of the movie, but I saw enough to realize, by the end, that the woman was dead and didn’t know it, and I saw enough to be genuinely creeped out. I never saw the movie again until last night, when I stumbled upon a title and read the synopsis. Intrigued, I found that the movie in its entirety is on You Tube, and I watched it, and I am pleased to announce that the movie remains as creepy to me now as it did then. The movie is the original, 1962 Carnival of Souls, a low budget ($33,000) horror film directed by someone named Herk Harvey. Carnival of Souls begins (the part I was asleep for all those years ago) with a drag race between a car full of young men against a car full of young women. The cars end up on a rickety old bridge over a river, and the car with the women goes off and crashes into the water below. While authorities dredge the river to no avail, a little ways downriver one of the women emerges, shocked and soaked. She has no memory of how she survived the crash. In a great plot device, we learn that the woman’s occupation is a church organist, and she’s been hired by a church in Utah to play their enormous, creepy pipe organ. She leaves her hometown, vowing to never come back, only a couple of days after the accident. Driving at night on her way to Utah, strange things begin to happen. First, her car radio starts to play strange organ music. She tries to change the channel and shut the radio off, but the same music continues to play. 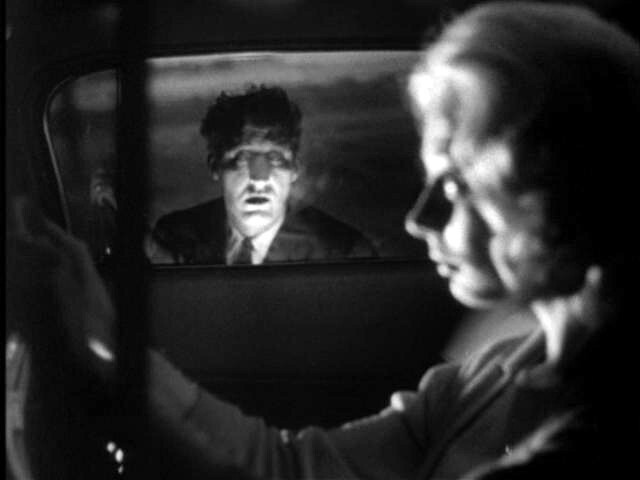 Then she has her first encounter with a strange ghoulish-faced man, this time replacing her reflection in the passenger window and staring at her. She passes by an abandoned amusement park and is strangely attracted to it. She gets to town and rents an upstairs room in a small boarding house. Just as she hopes to settle in and start a new life, things start unraveling, and she appears to be going mad. Aside from additional visits from the ghoulish man, she experiences periods where she is seemingly shut off from the world, where there is no sound and nobody can see or hear her. She ends up at the deserted amusement park, and sees dead people dancing to the organ music in a dance hall. She tries to flee from them, but they chase her, and she collapses on a beach with them closing in on her. Then the movie cuts back to the river, the dredgers have found the car, and her dead body is in the front seat. Prior to the 1970s, before advances in visual effects, before The Exorcist, horror movies had to rely primarily upon atmosphere to frighten audiences. The notable exception to this was Alfred Hitchock’s Psycho, which included graphic violence (the famous shower scene, which is brutal despite the fact that the camera never shows the knife touching Janet Leigh’s body) and explicit shock (the shot of Mother’s rotted corpse at the end). But these exceptions were rare, and even bigger budget horror movies of the time (like Jack Clayton’s “The Innocents” and Robert Wise’s “The Haunting”) were rich in mood and atmosphere. The only advantage these big budget films had over the low budget films was that they could pay for better writers and directors and actors. The result is that occasionally, low budget horror films were able to compete with and often times surpass their big budget rivals. And there were certainly enough horror films being made in the 1960s. There were the famous William Castle and Roger Corman B-movie products, as well as the Hammer studio films starring Christopher Lee and Peter Cushing. Possibly the greatest horror film of the time, George Romero’s “Night of the Living Dead”, was a low budget, independent film made in Pittsburgh. Romero’s genius was in that he let the lack of a budget work in his favor, the grainy black and white footage and the straight forward story telling approach and the use of amateur actors all resulted in a heightened realism, making the attack of flesh eating zombies more urgent and realistic. Carnival of Souls is similar in that the low budget cinematography, the amateurish acting (although the actress playing the lead, a Candace Hilligoss, is actually quite good, and brings a surprising range to her performance) and the simple but tight script and direction work and result in a whole that is greater than the sum of its parts. Harvey’s direction is top notch, as he uses the camera efficiently but creatively to convey the woman’s psychological state and maintain a consistent eerie atmosphere. He brings a level of storytelling and sophistication that is unexpected in a low budget production. The thing I find interesting in all this is that I had seen this movie once, about 40 years ago, and never knew the title, and never thought that much about it, until last night. Yet it stayed with me, buried in my subconscious, influencing what I’ve been writing. It makes me wonder what else is buried in there.